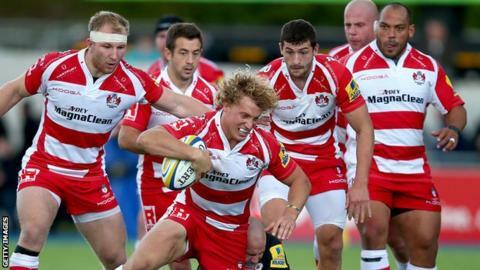 Gloucester earned a bonus-point victory over Zebre to remain unbeaten in Pool Five of the European Rugby Challenge Cup. The English side led 21-5 at the break with tries from Steve McColl and James Hook, while Hennie Daniller responded. Michele Visentin went over after half-time but scores from Matt Kvesic and Mark Atkinson sealed maximum points. Greig Laidlaw also added three penalties and a conversion with Billy Burns sending over two conversions. The result leaves Gloucester on 14 points, four ahead of their nearest challengers Oyonnax at the halfway stage in the group. Laidlaw got the hosts up and running with a sixth-minute penalty but it was Zebre who scored the first try through Daniller. However, a further Laidlaw penalty and a converted McColl try took the score to 13-5, with a further three-pointer and Hook's effort making it 21-5 at the break. Visentin went over on the overlap shortly after the restart but Kvesic powered over and Burns converted for 28-10. And Gloucester left it late to seal the bonus point with Atkinson finishing off fine work from Henry Purdy. Burns converted again as the score ended 35-10. "It's a bit of a cliché but if you had offered us played three, won three, with two bonus points at home and a win away in France - that's about as good as it gets. "There were elements of the game that weren't at the level we'd like them to be. There were too many mistakes and unforced errors. "If we're going to go to Italy next week and get the win, we're going to have to be better than tonight."